No, I’m talking about Professor John Dewey, hardly a household name for most people – but a continual presence in my life. When I was growing up John Dewey was a common topic of conversation in my home. 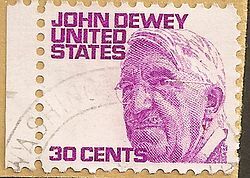 Dewey was an influential educator who had an enormous influence on public school curricula during the first part of the 20th century. My parents were very concerned about the state of American education – in part because of what they saw of the public schools I was attending in Washington, D.C. “Deweyism” was a shorthand phrase they used to cover all the perceived evils of “progressive education” of the sort they blamed on Dewey. The Soviet Union was the feared enemy and my parents were very concerned that American children were not being educated in a way that would enable us to win the technology war with Russia. For them, “Deweyism” included a general lowering of academic standards, lax discipline and too much time devoted to non-academic subjects like hygiene, crafts, “life skills” and the like. They felt that European countries were doing a much better job of educating their children and they particularly admired the high academic standards found in countries like Switzerland, France and Germany. When I arrived at university, I signed up for an introductory philosophy course and was surprised to encounter John Dewey again – this time not as a misguided educator who helped wreck the public school system, but as America’s most famous philosopher and a prominent member of the school of philosophy known as Pragmatism. Twenty years later, John Dewey entered my life once again, this time as as an articulate supporter of F. Matthias Alexander, the developer of the Alexander Technique, a method of learning how to move with ease. I had been drawn to the Technique somewhat by chance and was so impressed by the way it helped me improve my posture, coordination and balance that I decided to abandon my career as a research economist and move to England to train to become a teacher of the Technique. He’s even got his own stamp! It turned out that the same Dewey I’d been “living with” for most of my life had authored the introductions to three of Alexander’s books. 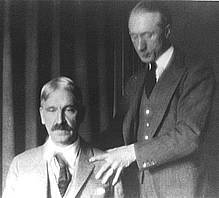 The two men met during World War I in New York City where Dewey, who was then in his late 50’s, had a series of lessons with Alexander. Those lessons so transformed him – physically and mentally – that he continued taking lessons from Alexander, and later Alexander’s brother A.R. Alexander, for the rest of his life. “The greatest benefit he got from lessons” Dewey said, “was the ability to stop and think before acting. Physically, he noted an improvement first in his vision and then in breathing. Before he had lessons, his ribs had been very rigid. Now they had a marked elasticity which doctors still commented on, though he was close to eighty-eight. 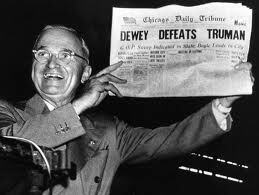 Apart from my parents’ dislike of what they believed Dewey stood for, I can’t say I have any real knowledge of what he did or did not do in the field of education. And the significance of Pragmatism – which apparently is today undergoing a revival of sorts – has always eluded me. Here’s our man having an Alexander Technique lesson with Alexander himself. But I do know something about F. Matthias Alexander and the Alexander Technique, and while Dewey’s writings are not always easygoing for the modern reader, over time I’ve come to realize that he had a profound understanding of the significance of Alexander’s work. And he was very articulate in expressing that understanding. Some of Dewey’s works were assigned reading in a course in education I took many many decades ago. Since formal education to me was more a hindrance than a help to my self-development, I had a generally positive emotional reaction to what I perceived as his strong emphasis on individual freedom in education — being encouraged and allowed to pursue one’s inborn passion for learning, in whatever direction it lead, with no artificial boundaries. Now, reading the quotes you’ve posted, knowing about the influence Alexander had on him, and being much older and more experienced, my appreciation and understanding of Dewey sit in me in a deeper and more satisfying way. Thanks for your comment Steve. I do think that Dewey, more than any of the others of Alexander’s famous students, really understood what Alexander was all about. Is this post still open for comment? I have a philosophical view of AT that differs in some marked ways from Dewey’s and would be interested in striking up a conversation if you have the time. If you scroll down on my site, you’ll see a series of posts about AT. Comments are always open, but I doubt this is the best place for a conversation. If your thoughts relate to Dewey and Alexander, Facebook would be the place. I couldn’t find the material on your sites you mentioned, but write a blog post on the topic, let me know about it, and if it’s any good, post it on FB, or ask me to. Or perhaps use the AT email discussion group, although the quality of interaction there tends to deteriorate fairly quickly. I’d be interested to know what you think when you have a moment. It’s an interesting thesis – I don’t have time to do it justice, but I will post this on my Face Book page and on some of the AT group pages so it can get more attention among Alexander teachers and students. Thanks very much, Robert. I appreciate it. As before, my take on AT is pretty far afield from orthodoxy, but I think it holds up pretty well (if I do say so myself). I’d be curious to hear your thoughts on it, if you have the time. The link on my main page is to a Facebook page, not a group at all. Anyone can “like” it who has a FB account. Thanks for that Barbara. I think the core ideas developed by Alexander have influenced people in a lot of fields and will continue to do so because they are so logical and practical. I’m glad you enjoyed it Rena. I’m planning a podcast interview or two about Dewey and Alexander. I drew on Dewey quite a lot for scholarly support for the Alexander Technique and also for my research methodology in my 2007 doctoral dissertation ‘The Future of Alexander Technique Teacher Education’. I’m now a member of the John Dewey Society. Reading the JDS journal is a great way of getting to know Dewey better. A few years ago I wrote a rejoinder to an article it ran about Alexander’s contribution to Dewey that was rather contentious. About 15 years ago a past president of JDS, Prof Jim Garrison from Virginia Tech, wrote a lovely book called ‘Dewey and Eros: Wisdom and Desire in the Art of Teaching’. He doesn’t mention FMA, but I can almost hear FM’s gentle voice in some of the text. If it’s still in print, I recommend it. Prof Garrison was also one of the examiners for my dissertation. A Deweyan philosopher who has written about Alexander is Prof Richard Shusterman. He is a Feldenkrais practitioner as well and has a perspective that some AT people might disagree with. Like him or not, I think we should be glad that academics like Shusterman are finding the time to acknowledge Alexander’s contribution to Dewey’s thinking (as did McCormack in his PhD dissertation of 1958). Thanks for that information Terry. I just remembered that we had done an interview for my podcast about the relationship between Dewey and Alexander and just now posted it at the bottom of the blog.